A trucking accident occurs when large trucks (10,000+ lbs.) collide with other vehicles or pedestrians. 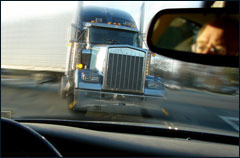 Truck accident injuries can be catastrophic injuries. Traumatic brain injuries, broken bones, spinal cord injuries, severed limbs, and massive internal injuries will likely require expensive surgeries, medications, physical therapy, and ongoing rehabilitation to maximize any chance of recovery. You may lose wages because of the time you had to take off from work to heal, and your motor vehicle likely will suffer extensive property damage in the crash. Around 500,000 trucking accidents occur every year in the United States. Of these, approximately 5,000 trucking accidents result in fatalities. In fact, 1 out of every 8 traffic fatalities involves a trucking accident. Of the fatalities that resulted from truck accidents involving large trucks, 78 percent were occupants in another vehicle, 8 percent were non-occupants, and only 15 percent were occupants of a large truck. Therefore, the majority who suffer as a result of fatal traffic accidents are innocent drivers and passengers just like you. The costs for fatal traffic accidents exceed $20 billion, including $8.7 billion in productivity losses, $2.5 billion in resource costs, and quality of life losses valued at $13.1 billion. Semi-truck drivers and the companies they work for have a duty to operate their vehicles in a safe and responsible manner. Unsafe driving, oversized loads and various other negligible practices put the public and the truck operators in danger. To protect your legal rights following severe injury or wrongful death resulting from a trucking accident, it is wise to immediately consult experienced personal injury lawyer, Richard Brown. Claims arising from wrecks caused by tractor trailers are much more complicated than simple automobile wreck claims. These cases can be very complex, involving governmental entities and large corporations. The Law Offices of Richard L. Brown is familiar with the Federal Motor Carrier Safety Administration and state regulations that govern trucking companies, and we know how to prove that truck driver negligence was the cause of your injury accident. We know how to examine the truck driver’s log and other necessary records to determine whether a trucker had been driving longer than the legally allowed number of hours when your injury or accident occurred, or if the truck did not undergo a required maintenance check or repairs. We will work with truck accident experts that can examine the truck and determine whether the accident happened because of an engine malfunction, the truck lacked the proper blind spot mirrors, or was overloaded with too much cargo. We will interview the truck driver and all witnesses to determine if the truck driver was speeding, distracted, tired, driving aggressively, tailgating, talking on the cellular phone, or driving under the influence of alcohol or drugs. We can send accident reconstruction experts to the scene to gather and examine evidence to prove your claim. If the truck driver, the truck company, its insurance company, or any other liable parties are unwilling to negotiate a fair and full settlement for your injuries and losses. Truck Accident Attorney Brown will personally oversee every aspect of your case. If the truck company and its insurance company are unwilling to negotiate a suitable settlement, we will file a North Carolina truck accident lawsuit and fight for your recovery in court. Contact our firm today for your free Union County Personal Injury evaluation. The Law Offices of Richard L. Brown Jr., represent those injured in a car crash, truck accident, motorcycle accident, auto accidents, and other motor vehicle related accidents.